LG had teamed up with HitRecord to give early testers a look at the LG V30 and share their content on a closed community forum. Well, the forum didn’t stay closed and photos were publicly posted. The photos reveal the device with no intention to tease the LG V30. The post has since been taken down. This is the most revealing look we’ve gotten of the LG V30 ahead of its announcement later this month. Participants of the early testing program were photographed holding and using the LG V30, so we get some revealing photos of the phone’s front and back sides. 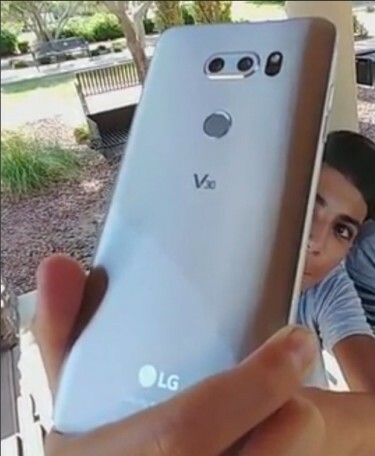 The photos coincide with leaks we’ve seen of the LG V30’s back glass panel. Complete with the dual-camera setup and rear mounted fingerprint sensor/ power key. The V30 is going for bezels that are even thinner than the LG G6’s. You can tell in the first photo of the first tweet above. Also, unlike the LG G6, the following photo shows a bevel around the camera (the LG G6’s camera is flush with the back). Given this, we can gather the LG V30 is going to have a slight camera bump. Like the V20, the V30 will also feature laser-assisted autofocus. It’s hard to see in these photos but it shares the opening with the LED flash. Unfortunately, we can’t make out a headphone jack from these photos, though the V30 is expected to feature Quad DAC support. The LG V30 is going to be announced on the last day of the month and will feature the latest Qualcomm Snapdragon 835 CPU, 4GB of RAM, and a QHD+ 6.0-inch FullVision OLED display with dual curved edges. Who cares about a slight camera hump?not me...innovation comes 1st..16mp with worlds 1st f./1.6 aperture,wow LG..plus it look beautiful and has the best in class audio..surely my next device. Funny, I just read tips on how to save battery power on GS8 and they include tips like turning off features like Bixby and setting lower resolution. Features that sheep paid for.